In recent years, the intensity of the Harvard-Cornell matchup has risen to great heights in men’s basketball and men’s ice hockey. Both will take place this weekend as fans will have to choose between the two. Tom Williams’ Bulldogs were fighting for more than victory in the 126th playing of The Game last November. They were also fighting for relevance in the minds of the Crimson student body. For though Harvard-Yale weekend is historic in its own right, the Bulldogs can no longer be considered the Crimson’s most hated foe. That enemy would prove to be Cornell, Harvard’s biggest rival in men’s basketball and men’s ice hockey. The newfound rivalry between the Big Red and the Crimson is more current, more competitive, and much more focused on the actual game at hand. And Friday’s upcoming games in both sports have the Harvard student body in a kind of pre-game fervor that November’s football game can’t match. This time, the attention focuses on the contests themselves rather than on which house will sport the best tailgate. 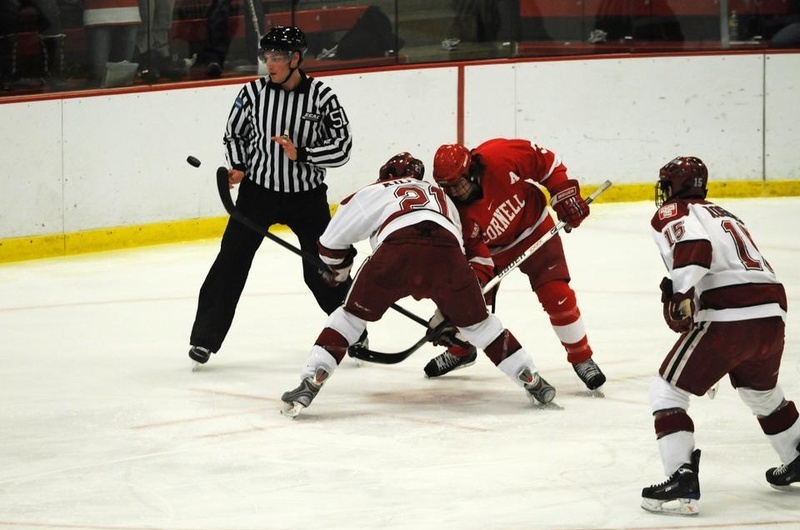 While the Crimson puts a big red X on its calendar for both home contests against this school, it would be a mistake to call the Harvard-Cornell clash a single rivalry. One is based on history; the other is a new invention. One features prominently in Love Story; the other is somewhat covered by ESPN. And last Thursday, students had to choose which rivalry they wanted to see when it came to reserving tickets for either game. When the Big Red skates onto the ice at the Bright Hockey Center this Friday at 7 p.m., it will mark the 132nd clash between the programs, a rivalry with no shortage of bad blood. Cornell still hasn’t forgiven the Crimson fan who threw a dead chicken at its goalie, Dave Elenbaas, in 1973. The Big Red ended that game with the upper hand by all measures. Not only did it knock off the then-top-ranked Harvard en route to an eventual NCAA berth, but Cornell fans got more animals on the ice that season as well. Later that month, Big Red fans threw dead fish onto the ice and tied a live chicken to the Crimson goal later that month. But Cornell still wasn’t satisfied, and the two teams have been going at it ever since. Erich Segal didn’t help Harvard out when he included a Harvard loss to the Big Red in Love Story. The movie’s theme song is now a frequent taunt at Lynah Rink. The basketball rivalry is a much more recent phenomenon, fueled not by tradition but by relatively recent emergences of both programs. Neither is a traditional hoops powerhouse in a league historically dominated by the “Killer Ps”—Penn and Princeton. Cornell didn’t become the top dog until two years ago, and Harvard hasn’t threatened to take the title until this year. Now the hoops rivalry between the two Ivy League institutions has taken center stage on campus and has been recognized across the nation as well. Crimson co-captain Jeremy Lin has become a household name this year thanks to a feature in Sports Illustrated, 30 points against UConn, and a current second-place standing in the fan voting for the Bob Cousy Award. But as Harvard found out the hard way last month, the Big Red’s got a pretty decent team as well. Cornell sent a shock throughout the nation when it took Kansas, ranked first in the nation both then and now, down to the wire. The team has cooled off a little as it recently suffered an upset at the hands of Penn, a team the Crimson beat by 14. But the Big Red had more than enough firepower against Harvard last time, beating it by 36. On Friday, we will find out if the loss to the Quakers was a simple speed bump on the road to March Madness or if it was the beginning of the end of Cornell’s reign. Unfortunately for the Crimson, which saw its season take a setback with the injury of sophomore Keith Wright, Cornell has plenty of depth in case one of its stars goes. Junior Mark Coury, a starter for Kentucky last year, has only started one game for the Big Red. Apparently starting for the Wildcats isn’t enough to compete for a starting spot against seniors Ryan Wittman and Jeff Foote. The hockey teams have their fair share of stars as well—including 12 NHL draft picks between the two of them. Harvard freshman Louis Leblanc highlights the group. The 18th overall pick in the 2009 draft, Leblanc was the first Quebec native to be selected by the Montreal Canadiens in 21 years. Another future NHL player is Cornell junior forward Riley Nash, picked 21st two years prior by the Edmonton Oilers. The Crimson boasts five more former draft picks—captain Alex Biega, senior Doug Rogers, junior Matt McCollem, sophomore Alex Killorn, and freshman Alex Fallstrom. (Alex seems to be a good name for Harvard hockey players.) Meanwhile, the Big Red have five more draft picks after Nash. Both star-studded games. Both huge rivalries. Both starting at the same time? That doesn’t seem right. One would expect the Crimson to schedule the games at different times, so action-hungry fans could double-dip when Cornell comes to town. Perhaps there was some confusion because the rivalries have such different traditions, such distinct histories. Maybe it’s time we bring the two together and treat them as one fierce rivalry. The Big Red is definitely Harvard’s biggest rival right now. —Staff writer Christina C. McClintock can be reached at ccmcclin@fas.harvard.edu.